The RhoMobile Suite installer installs Rho products, such as Rhodes, RhoConnect, RhoElements, and RhoStudio. RhoStudio is an Eclipse installation that facilitates development of native smartphone applications. RhoStudio requires Java Development Kit. For Mac OS 10.6 and earlier, the JDK is already installed. For Mac OS 10.7 and 10.8, Java is not automatically installed. Download the Java for Mac Installer from Apple support and install Java 6 or higher. On Macintosh, you need the following setup before redis is installed. The /usr/local directory exists and is recursively writable by the current user. The /usr/local/etc/ directory exists and is recursively writable by the current user. If you do not have the latest Xcode and command line tools, you need to install them. Install the latest Xcode. Then install Homebrew into /usr/local. To use RhoConnect Push, you need to install Node.js. Go to the Node.js website, and download and install Node.js. Or you can enter the following command after you install Homebrew. If you do not have Ruby Version Manager and Ruby 1.9.3 installed, you must install them. On Macintosh, Ruby is already installed, but this version is outdated and isn’t compatible with RhoStudio. Install Ruby Version Manager (RVM) into your home directory. Do not use sudo when you install RVM: that can cause problems with file permissions when you run bundle commands within RhoStudio. Install Ruby 1.9.3 with the following RVM command. Download the latest Zebra RhoMobile Suite Installer for Macintosh. This contains Redis, RhoConnect and Rhodes. Run “Install gems”. A terminal window will open. Select suitable Ruby version and whether to use ‘sudo’ prefix for gem installation. Wait for the gems install process to complete. Run “Install rhoconnect-push”. A terminal window will open. Select whether to use ‘sudo’ prefix for installation. Wait for the rhoconnect-push install process to complete. Drag Zebra RhoStudio to the Applications folder. RhoStudio has two launchers: RhoStudio 32-bit and RhoStudio 64-bit. Use the launcher suitable for your system. 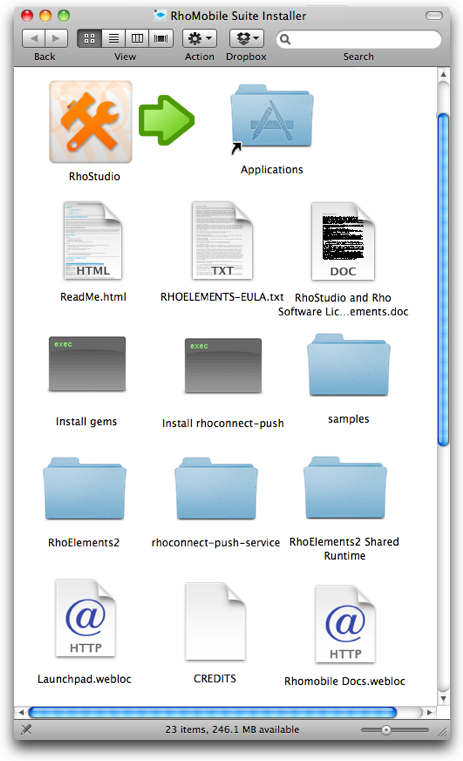 A folder containing a RhoElements application. A folder containing sample applications. A folder containing the RhoConnect Push Service files. You use these when you set up the RhoConnect Push Service on your mobile device to broker push messages between your RhoConnect server and your device. A folder containing the RhoElements Runtime files. You use these when you create a RhoElements hybrid application, or when you create a RhoElements native application in shared mode. A link to the Launchpad Developer Community. A link to the RhoMobile documentation website. The RhoMobile Suite installer for Macintosh does not install Git. Although you can develop without Git, it is a very useful tool, and is needed for RhoHub. You can install Git on Mac. RhoMobile Suite installer for Windows contains Ruby 1.9.3-p194. This Ruby is used for rake commands on the developer computer and to run RhoConnect applications. RhoMobile Native applications use Ruby 1.9.2-p290. This Ruby is used on devices. Ensure that Java Development Kit is installed. The Sun JDK for Windows is available here. Download and run the latest Zebra RhoMobile Suite Installer for Windows. This installs the Ruby stack, Redis, RhoConnect and Rhodes. If you use Symantec Antivirus it can warn about “Suspicious.MLApp” security risk in rubyw.exe file during installation. It is known false positive in Symantec antivirus. Open <RhoMobileSuiteDir>\rhostudio\win32.win32.x86\RhoStudio.ini file in editor. Find “-Xmx1024m” line and change it to “-Xmx512m”. The 32-bit Windows version of the JDK is required for Blackberry tools. Use Zebra RhoStudio 32-bit launcher to run RhoStudio. Go to RhoStudio Preferences (Windows –> Preferences), select RhoMobile section and set the Java bin path. Set this path to JDK, such as C:\Program Files\Java\jdk<version number>\bin . A link to the developer community. A link to the RhoMobile documentation. A link to the readme file. A link to the RhoElements Runtime files. You use these when you create a RhoElements hybrid application, or when you create a RhoElements native application in shared mode. A link to the RhoConnect Push Service files. You use these when you set up the RhoConnect Push Service on your mobile device to broker push messages between your RhoConnect server and your device. An uninstaller for RhoMobile Suite. Reduce JVM heap size. Likely your computer has not enough memory. Open <RhoMobileSuiteDir>\rhostudio\win32.win32.x86_64\RhoStudio.ini file in editor. RhoMobile Suite installer for Windows contains Ruby 1.9.3-p194. This Ruby used for rake commands on developer computer and to run RhoConnect applications. RhoMobile Native applications use Ruby 1.9.2-p290. This Ruby used on devices. Ensure that Java Development Kit is installed. The Sun JDK for Windows is available here. Install Windows x64 JDK or x86 JDK or both. Use Zebra RhoStudio 64-bit to run RhoStudio with x64 JDK. Go to RhoStudio Preferences (Windows –> Preferences), select RhoMobile section, and set the Java bin path. Set this path to the x86 JDK, such as C:\Program Files (x86)\Java\jdk<version number>\bin . 32-bit launcher is compatible with x86 JDK. 64-bit launcher is compatible with x64 JDK. When you start RhoStudio, you set the location of the workspace directory. Set this path to a workspace directory that does not contain space symbols: if the path has spaces, a RhoConnect application created with RhoStudio will not work properly. Zebra RhoMobile Suite installs into a Zebra RhoStudio folder. Old versions of RhoStudio installed into a RhoStudio folder. Check that you start from Zebra RhoStudio. If you develop Rhodes apps (or RhoElements native apps), you will need the SDKs for the platform you want to build your app on. These instructions are found here. You can either run rhodes-setup, or you can set the SDK paths in RhoStudio Preferences. Installing RhoStudio as a plugin for Eclipse is currently disabled. RhoSimulator, which comes with RhoStudio for Mac and Windows, does not work with Linux.